Welcome to Twisted Branches - "Home of the First Real Freebie Website" where everything listed is always 100% Free and there is never a hassle to sign up for anything! You will not have to complete another offer to receive your free item, and you will not find any of those "yes-yes," "no-no," type of questionnaires here either. Those aren't real freebies and we will not list them on our site! We are currently in the process of updating our website and making our transition back home after closing Twisted Branches Forums and greatly appreciate your patience during this time. Be sure to check back often and watch for announments on Facebook and Twitter. In the meantime, may we suggest you use our "Site Map" to navigate our website and if you have and questions or concerns, please Contact Us. 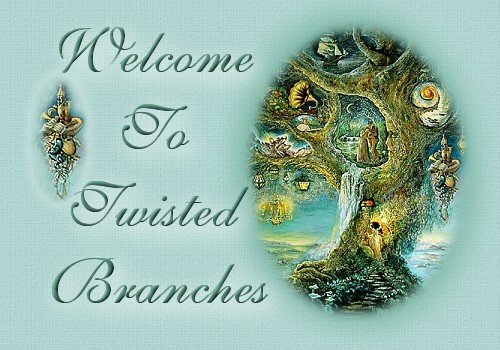 Thank you for visiting Twisted Branches and please drop by again! Free gifts, samples, magazines and information for babies and new and expecting parents. Free cosmetics, beauty supplies, accessories and more. Sign up for free product samples, giveaways and promotional products. Free books and brochures for your reading pleasure. If you like to read but want to avoid spending money, you will want to check this out. We have free entertainment and informative offers too! Check it out and see what offers you can find. Find free t-shirts, hats, wristbands and more! Free samples and promotional items for your office or business. Lots of free cookbooks and recipe brochures. If you like to cook, be sure to check this one out! Free samples, coupons and more, that let you try before you buy. Check out what's new with free samples and coupons from brand name manufactures. Find free samples of shampoos, conditioners and other products for your hair. You'll find tons of free samples here. Pain relievers, vitamins, supplements, weight loss products and more! Find samples and free offers of household cleaning and maintenance products for your home and garden. Sign up for complimentary subscriptions for magazines without any obligation what so ever. All these offers are 100% Free! We put everything else here. Tons of freebie offers you won't want to miss! Find samples of fragrances that let you try before you buy. Sign up for free razors, deodorants, soaps and other personal products here. Free samples and coupons for free pet products for all your pets and more. Here's one that might appeal to the teens out there. Check out the selection of free posters we found for you. Find all the free religious offers all in one place from bibles to cds to magazines. And don't forget to sign up for your free stickers. The kids love these you know! Planning a vacation or like to travel? Be sure to check out these free offers before you go on your next trip! We hate to see you go, but if you must, here are some links to other freebie sites you might want to check out. Disclaimer: The information provided on this site is for entertainment purposes only. All offers claimed to be free at the time of listing and we do not endorse or take responsibility of any kind for their content or availability. Please be responsible when ordering anything online. To report a bad link please "Contact Us."